Do you click on a blue 'e' to surf the web? 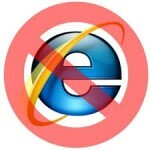 If so switch browsers now. ← iPhone vs Android – Best for Business?